Mini Clock Spy Camera From Six Technologies Inc. 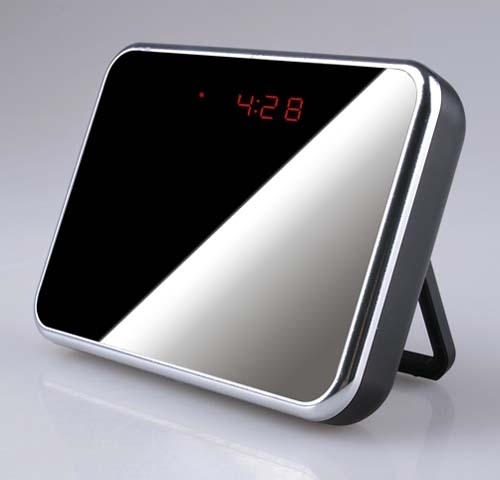 These functional clocks with hidden cameras are a great option for covert recording. Upgraded design. The sleek new design with red LED display will fit in anywhere. The display cycles through time, date, and temperature. High resolution video. Records both audio and 1280 x 960 color video. Multiple settings. Use the remote control to choose between motion detection, audio only, and continuous recording settings. Lengthy battery life. The included Li-Ion battery lasts for up to 24 hours on one charge. Easy file transfer. Store up to 32GB of data on Micro SD. Whether you're looking for a nanny cam or to keep watch on your room while you're away this hidden camera won't let you down. Dimensions: 5 x 3.5 x 1"